1) ‘Īd Mubarak! 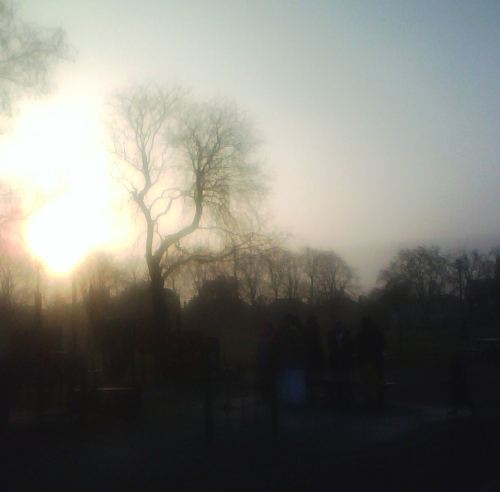 Yup, ‘Īd-in-the-park/" target="_blank">I prayed in the park again… and yup, it was bloomin' cold! But thankfully not wet, alhamdulillah. Didn't harrass any small children this time, though there were two very cute girlies sat near to me. Their mum was rather clever and brought a thermos of something nice n' hot for them to sip on during the khutbah – why didn't I think of that?! 2) Does anyone have a clue about either digital video cameras and/or regular video cameras whose footage can be easily digitised? Purpose: amateur film production – really amateur. Short films. Not looking to win an Oscar for cinematography, kinda thing. Hoping to bag something in the January sales inshā’Allāh, but have no clue where to begin! 2) I’m not sure what you want to know, and I’m no expert. But use of any digital camera will give you digital results. Do you have a camera? Just shoot it and transfer it to your computer and then you can upload online if you wish. 3) I like Scottish accents too. I have often said I might want to marry a Scottish lass. 2) Just as clueless, sorry. You can share my accent anytime iMuslim! I realize I misread your question about cameras, hence my pointless answer. Sumi: Yey! Can i borrow it this weekend? McP: hey, you beat me to the submit button by one minute! :D Yeah, you’re right about the “British” accent point… there’s not even really a typical “English” accent. And i don’t have a London accent. I’m not sure what i have! Btw, have i ever told you guys that you’re all completely useless?! Where’s all the advice on video cameras, eh? What’s the point of having a blog if you can’t have instant access to a couple of in-house tech-geeks?! Am i mistaken? This is the internet, right?? You have all disappointed me. Be ashamed. Be very ashamed. @ McP – you’re right! But I love ALL British accents… London, Cockney, and every other variation you can think of! Sorry iMuslim! My advice is… don’t get a camcorder that takes mini-DV tapes, I’ve no idea how to digitise that *nodnod*. I hear they record straight onto DVDs now or something? Or memory cards? Bah humbug, I have no idea! 1) Eid mubarak to you too. 2) If you’re going to upload the movies a lot then perhaps your best bet would be the new HDD camcorders that record the image directly onto a hard disc? They don’t need DVD’s or tapes. However, I have recently seen a ‘hybrid’ model as well – which means you have the option of recording onto the hard disk or the DVD. 3) I could give you a Cork, Kerry or a Dublin accent – but you must tell me how one donates accents? Sorry, no Scottish here! & Jazakallah peeps for advising me on camcorders… but i think i’m actually gonna ignore you guys, and invest in a Canon HV20 – it’s a mini-DV camcorder, but it can also record in High-definition. I suggest you look it up on YouTube and see the test footage from different users… it’s really good. It has also received lots of great reviews, masha’Allah. Only thing is the price… the lowest price i have found online is £499.99! I’m not in a rush, so will see if the price comes down in the next few weeks, insha’Allah. But i kinda have my heart set on it! Oh btw, mini-DV, HDD and DVD are all forms of digitial media – even though the first one is tape, the device records the info to it digitally, and so the footage can be easily transferred to your PC.